The Aga Khan University’s Centre for Innovation in Medical Education (CIME), a state-of-the-art facility for technology-based learning for health professionals, was inaugurated today by His Highness the Aga Khan, Chancellor of AKU. The 80,000-square foot, Rs. 1.6 billion ($15 million), donor-funded Centre comprises three buildings – the Mariyam Bashir Dawood Building, the Ibn Sina Building and the Shiraz Boghani Building. The Centre offers multi-purpose teaching spaces, high-fidelity simulators, and specialty environments such as the phantom-head dental lab, a cardiac catheterisation lab and telemedicine clinics. “AKU has been the recipient of significant philanthropic support,” he added. “That support has enabled us to launch important new ventures, build new facilities and achieve ever-higher standards. His Highness the Aga Khan laid the foundation stone for the three buildings of CIME during his previous visit to Pakistan in 2013. 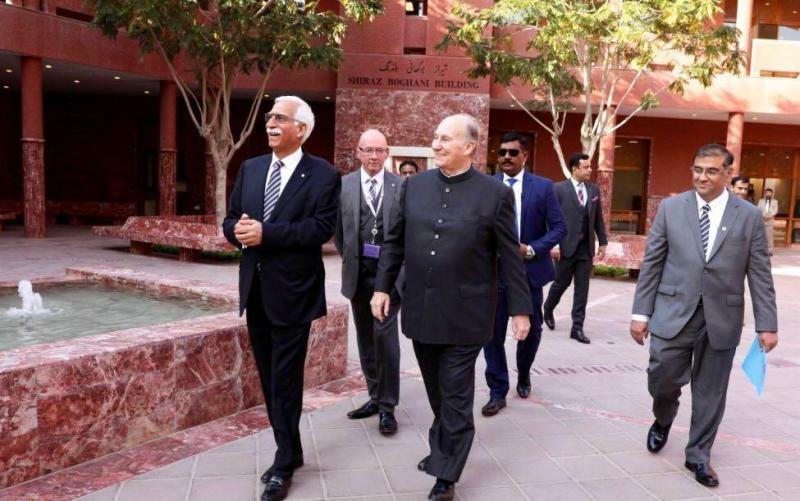 The inauguration of the facility on Friday was part of the Aga Khan’s state visit to Pakistan on the occasion of his Diamond Jubilee: the 60th anniversary of his accession as the spiritual leader of the Shia Ismaili community in 1957. Prince Karim Aga Khan on Friday inaugurated the Centre for Innovation in Medical Education (CIME) at the Aga Khan University as he urged to position the new institution ‘in its correct place’ in service to Pakistan. Inauguration of the centre – a state-of-the-art facility for technology-based learning for health professionals – was part of the Aga Khan’s state visit to Pakistan on the occasion of his Diamond Jubilee – the 60th anniversary of his accession as spiritual leader of the Shia Ismaili community in 1957. 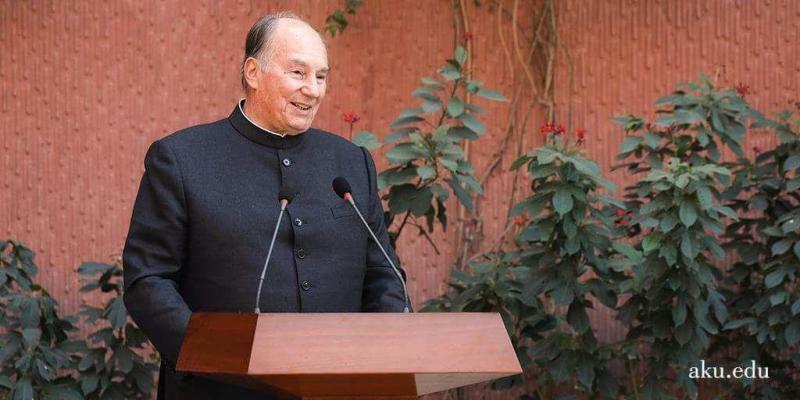 The Aga Khan, who reached Karachi on Thursday after his visit to Northern areas and Islamabad, had laid foundation stone for the three buildings of CIME during his previous visit to Pakistan in 2013. In his address, Prince Karim acknowledged the many contributions made towards the advancement of healthcare in the country, adding that civil society was underserved in education in Pakistan. Speaking on the occasion, CIME Director Dr Charles Docherty said the centre aims to raise the bar for teaching and learning and to thereby deliver higher standards of practice across the professions of medicine, nursing and allied health. The 80,000-square foot, Rs1.6 billion, donor-funded centre comprises three buildings – the Mariyam Bashir Dawood Building, the Ibn Sina Building and the Shiraz Boghani Building. The centre offers multi-purpose teaching spaces, high-fidelity simulators, and specialty environments such as the phantom-head dental lab, a cardiac catheterisation lab and telemedicine clinics. Learning from other such centres around the world, CIME supports student-centred problem-based and team-based learning. Students and professionals from different disciplines work together on real-life patient simulations. For example, nurses and doctors can practice responding to a situation in which a patient stops breathing, using a high-tech mannequin that responds as a real patient would respond. Afterwards, they can watch a video of themselves and analyse their performance. “In everything we do, as our chancellor says, ‘we must look to the future, seeking always to think creatively, to innovate and to improve,’” said AKU President Firoz Rasul. He said technology-enabled learning had the potential to transform how the centre prepared students and professionals to face society’s most pressing issues. “By giving today’s health professionals the most advanced facilities to work and learn together at CIME, we give them the best chance of becoming leaders capable of solving tomorrow’s challenges,” he said. He said the AKU had been the recipient of significant philanthropic support. “The support has enabled us to launch important new ventures, build new facilities and achieve ever-higher standards. We are very grateful to our donors for their extraordinary generosity,” he added.